When comparing the specs between Waterpik’s Complete Care models you’ll find that there aren’t many differences between them. However, how recently a product was released correlates to how high its current price is, and vice versa. Thus, if you are in the market for the latest Complete Care system, like the Complete Care 9.0, you will get a sleeker looking product that is not necessarily much better than the Complete Care 7.0, and you will pay a premium for it too. Compared to the Complete Care 5.0, as well as the newer model, the Complete Care 9.0, the Complete Care 7.0 has a slightly larger footprint. If you do not have any room to spare on your bathroom counter, then you should consider either of those over the Complete Care 7.0 (WP-950). There are lots of other subtle differences between these models which we will cover, and if you don’t mind having a slightly older product that does what the other models do but for a lower price tag, then keep reading this review. Keep in mind by “older” we only mean a few short years of difference, and unlike the tech industry, a few years of difference between products in the water flossing niche is not as big of a deal. What’s included in the Complete Care 7.0 WP-950? 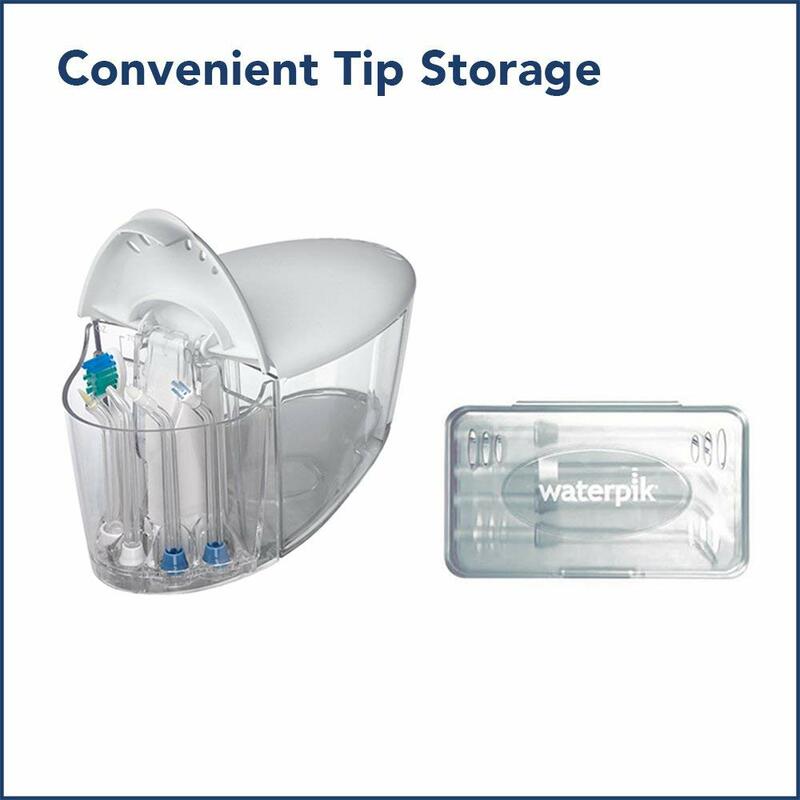 Waterpik’s Complete Care systems are designed to give you an all-in-one solution for your dental health routine. If you don’t already have a water flosser or an electric toothbrush, these products are an incredible value. The entire unit weighs in at 2.45 lbs, which is identical to its predecessor, the Complete Care 5.0. The weight helps it to stand firm on your counter while you are inadvertently tugging at it while flossing. The WP-950 measures at 7.7” x 5.0” x 10.6”, and has a larger base than its predecessors for a more stable footing. If you don’t have the counter space for the Complete Care 7.0, then consider the Complete Care 5.0 and Complete Care 9.0. Located at the top of the unit is a large water reservoir, capable of holding 700 ml (23 oz.) of water. How long will that last you when flossing? 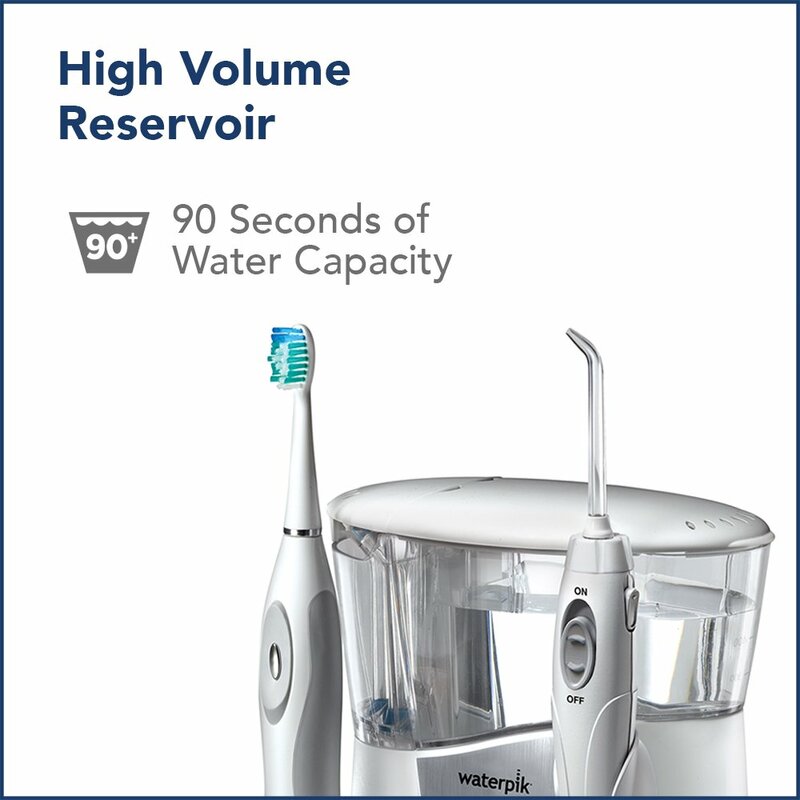 At the highest pressure settings, you can expect 90 seconds of continuous use before it runs out. If you set it to a lower pressure setting, you can floss for several minutes before you need to refill it. Furthermore, it is dishwasher safe (top-rack only), but you will first need to remove the rubber valve at the bottom which prevents the water from leaking. The two dials at the front of the unit are straightforward to understand. One is the power on/off switch, and no elaboration is needed as to what it does. The other is the pressure control dial, which lets you select between 10 pressure settings. At level 1, the water pressure is 10 PSI, and at level 10, the pressure is at 100 PSI. We recommend you start at the lowest setting and slowly increase it as you adjust to the water pressure. 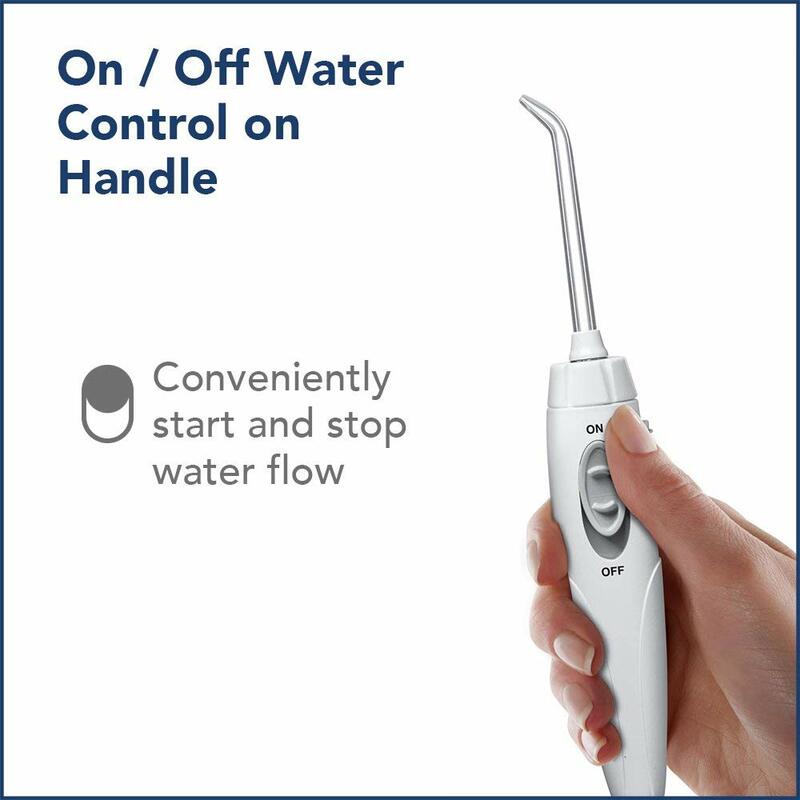 Moving over to the flosser handle, notice that it has a nifty pause slider which pauses and starts the flow of water at your discretion. The handle is ergonomic, fitting snugly into the contours of your hand and is easy to maneuver as you’re flossing. There is also an eject button on the handle, which helps you to remove or replace the flosser tip. This feature can already be found on older models and we are glad to see it is included in this one as well. You can also rotate the flosser tip 360 degrees to give you the optimal angle to floss at. The Complete Care 7.0 comes with multiple flosser tips and brush heads. You can choose between them to provide the best cleaning experience possible. Let’s go over what each one does. 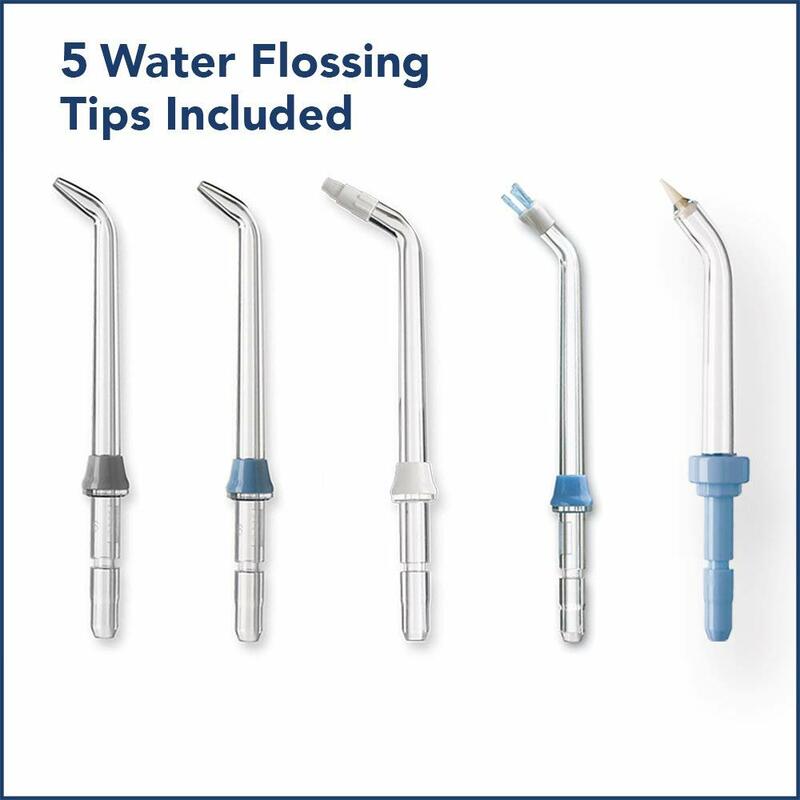 Classic Jet Tip (x2): These are the standard flosser tips included with every Waterpik product. They are excellent for general purpose flossing, and should be replaced every 6 months. Orthodontic Tip: The orthodontic tip, as the name suggests, is good at cleaning orthodontics such as braces. The concentrated tufts of bristles at the end allow you to scrub off stubborn food debris off your teeth and braces. Plaque Seeker Tip: The three thin tufts of bristles on the plaque seeker tip can be used for a more delicate clean, which is excellent for use on dental implants, crowns, bridges, and retainers. Pik Pocket Tip: The pointy end of the Pik Pocket tip allows you to wedge into periodontal pockets and give them a nice flush to remove any plaque or debris that may have gotten stuck inside. All of these tips (as well as brush heads) can be placed in the hinged storage area located beside the water reservoir for easy access. We’ve been talking a lot about the water flosser so far, so let’s go over the other half of the “complete” package, the Sonic toothbrush. 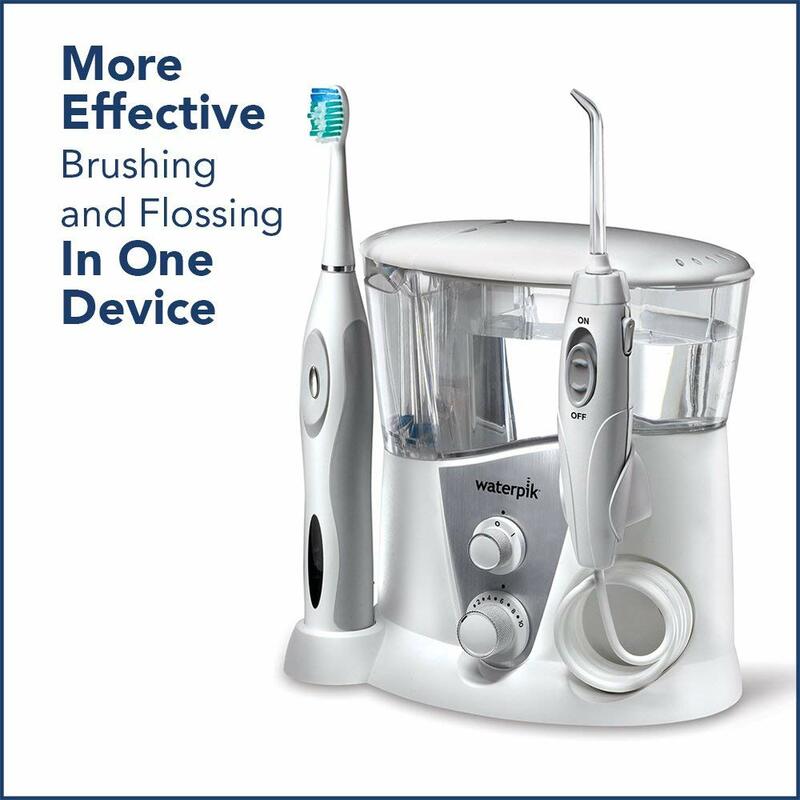 The SR-3000 toothbrush has two modes, high speed and low speed, which you can alternate with the press of a button. Pressing the button once turns the toothbrush on, and the second press switches the user between the high and slow speed modes. There is a built-in two-minute timer which helps you pace your brushing session. Every 30 seconds the toothbrush will vibrate, reminding you to move to another of the other four quadrants of your mouth and start cleaning there. The toothbrush is charged by an induction charger and has a built-in battery. It is also water resistant, which allows you to use it even in the shower. 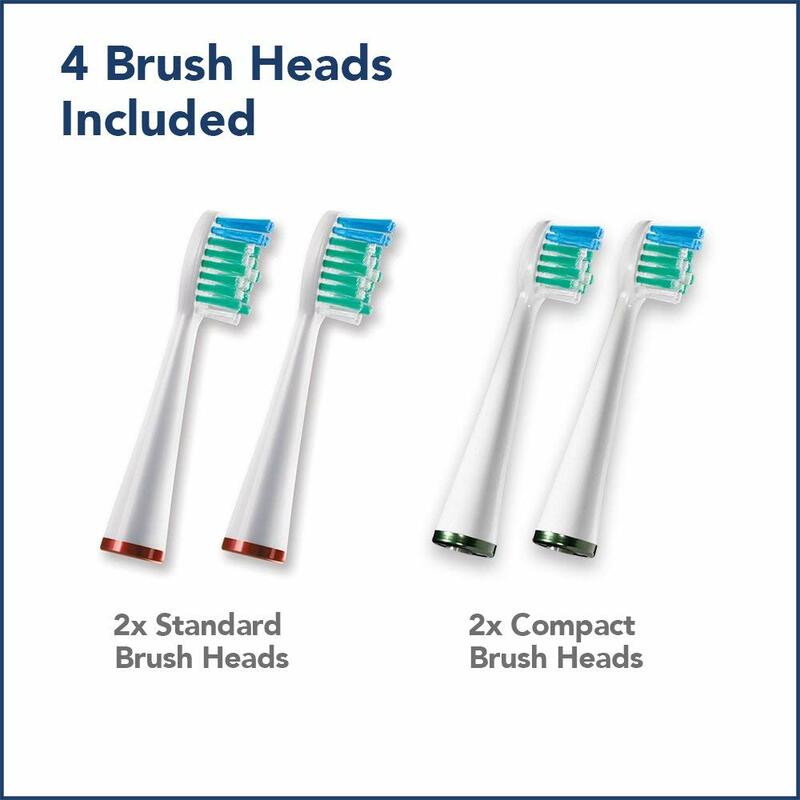 Lastly, the sonic toothbrush comes with 4 total brush heads, two regular and two compact, which allows you to swap brush heads between family members or you can simply use it as a spare. The battery indicator in the front near the bottom lets you know how much juice is left and when you should be charging it soon. Lastly, the included premium toothbrush travel case is a nice bonus so you can take your toothbrush with you while travelling. The Complete Care 7.0 WP-950 is an upgraded version of the older models which looks more futuristic and has a few extra features. The biggest differences are its control panel and slider, and of course how it looks on your bathroom counter. In terms of cleaning power, there is not much differences between the Complete Care packages, which is to say they are all excellent at what they do. 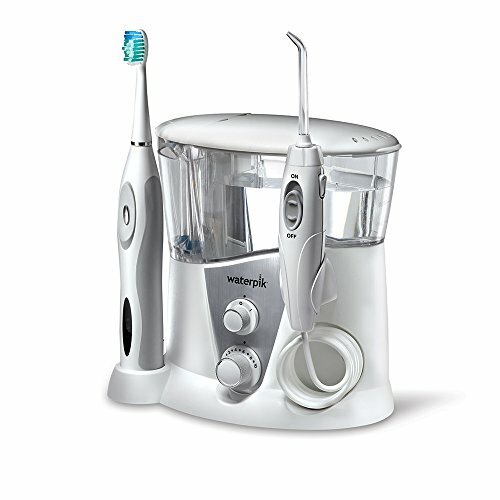 If you don’t already have an electric toothbrush or water flosser and are looking to get started with both, then the Waterpik Complete Care 7.0 WP-950 will give you great value to clean your gums and teeth. If you are someone who is constantly on the go but still wants to water floss, we recommend you check out the Waterpik Traveler WP-300 water flosser instead. You may also be interested in our Waterpik aquarius vs ultra comparison as well.